If you think it’s a coincidence that Adam Dunn just had the best game of his 10-year career after a weekend of trade rumors had him being shipped off to the Chicago White Sox, then you’re clueless. 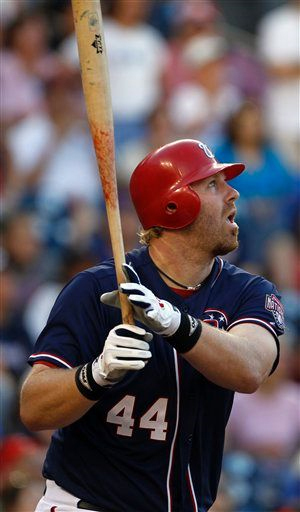 Dunn’s offensive explosion – a three-homer night which paved the way for the Washington Nationals’ 7-6 victory over the San Diego Padres Wednesday night – was clearly a sign from the slugger that he’s very comfortable in D.C. and isn’t in a rush to play elsewhere. Of course, none of this guarantees that Nationals general manager Mike Rizzo will do what’s necessary to keep Dunn in town, but he should. The only other player to have a three-homer game for the Nationals since they moved to Washington is Alfonso Soriano, who accomplished the feat against Atlanta back in 2006. Soriano, as you might remember, was a big-time slugger who management let get away. Sound familiar? It’d be a shame for history to repeat itself, especially for a franchise as offensively challenged as the Nationals. Even his teammates realize the situation, and thankfully, are doing their part to speak on behalf of Dunn. “One of the hardest things to find on a team is a 3-4-5,” said Zimmerman in reference to the team’s batting order of him, Dunn and outfielder Josh Willingham. “Obviously, he’s one of the best four hitters in the game, has been for the last five or six years. He’s a very, very important player to this team in what we do offensively, not only in the field but in the clubhouse, as far as helping out the young guys. After the game, Dunn wasn’t up for speculating about his future. Instead, he said he was just happy to turn things around after going homerless in his previous 12 games. Dunn is now batting .280 with 20 homers (tied for second in the National League) and 54 runs batted in (tied for 12th in NL) this season. Simply put, he’s been everything the team could hope for offensively. This is the point of the conversation when I point out that Nats owner Ted Lerner is worth more than $3 billion dollars. Yes, I said billion. You wouldn’t know it by looking at his team’s payroll though, as the Nationals rank 22nd this season – behind notoriously cheap franchises like Milwaukee, Tampa Bay and Kansas City. With 20 homers and 54 RBIs through 84 games this season, it’s a safe bet that if Dunn stays healthy he’ll end up with the same production he’s been good for over the last six seasons. The guy rarely misses games due to injury and is automatic at the plate. And unlike the hot heads in Tampa and other cities who get into screaming matches that play on an endless loop on SportsCenter, Dunn remains mellow at all times. He’s so laid back and easy going that it can’t help but rub off on his teammates. Lerner has said from the get-go that he’s not afraid to spend money when the time is right. Well, we’ve reached that point. Blow the cobwebs off of your checkbook and lock Dunn up for another three or four years at a fair-market price and give your general manager/skipper one less position to worry about. Dunn deserves it, and more importantly, your fans deserve it. I am just glad you didn’t go and only say “Pay da man!” like that no talent hack on ESPN who we all want to fade away. No sir, you eloquently put forth a well thought out conversation in actual American. We commend you, American Speaking Blogger Man. If the Nats can get any kind of young quality from someone for Dunn, TAKE IT! The man’s negatives far outweigh his one positive: The ability to hit about 40 homers a year. He should have many more RBIs for a guy who hits 40+ dingers a year. He K’s too much. As for his glove, well, the guy couldn’t catch the clap at a Philippino whorehouse. Rob some contender who thinks his big stick might lead to some October baseball. Maybe they’ll find a quality no. 3 starter.